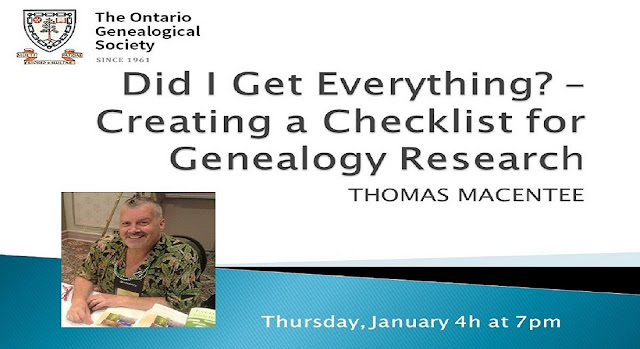 The Ontario Genealogical Society is thrilled to have Thomas MacEntee to kick off the New Year and start our 2018 Webinar Series!! Please feel free to join us - our live webinars are free and open to everyone. Are you really done with researching that ancestor? Many genealogists think they have a brick wall when, in fact, they just haven’t done a “reasonably exhaustive search.” Learn how to assemble a genealogy research checklist to take your genealogy to the next level. Participants will learn how to identify gaps in their genealogy research and then move to the next level of research. These levels include using genealogy networks, going beyond online research with the help of Family Search Centers and other “offline” resources, and crafting a genealogy research checklist. NOTE: this presentation will be modified to include Canadian resources!